It's spring, and the world is waking, turning green, singing, but there's trouble in Shrubsbury. Unknown to Alex and his elderly partner, Tasha Mulholland, scandal-adultery, thievery, and even murder-is brewing among some of the town's most respectable citizens. 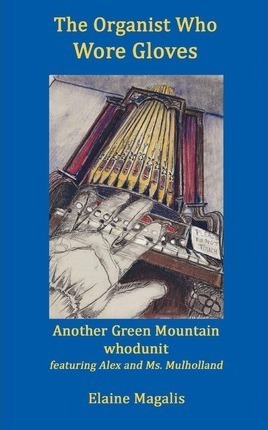 The case of The Organist Who Wore Gloves begins when a mysterious musician plays the reed organ in the Old Shrubsbury School Museum on a cold spring night. Why was he playing Bach and Fats Waller at the coldest time of day in a building that had been closed for the winter, where the temperature was polar? When the musician is found dead in the farm pond across from the museum, what might have been a simple musical riddle becomes a murder investigation. The story begins in the Shrubsbury museum; it takes our sleuths down a gleaming Vermont highway to the village of Brattleboro where Estey organs were manufactured and marketed for more than 100 years, and to a mansion where a very old man performs musical magic. Alex and Ms. Mulholland continue to be as unlikely as the murders they're called on to investigate. Not many months have passed since they solved the case of The Body in the Butter Churn, and Alex is waiting for his thirteenth birthday. The difference in their ages has never been more of a problem. There are so many things they can't share. But then again, there are so many more things the excitable kid and his old lady friend can share-and do. Elaine Magalis worked for many years in a Vermont history museum with kids, old people, and the ghosts of people past. She's written a number of books, most of them unpublished. This is the first in her series on the adventures of Ms. Tasha Mulholland and Alex Churchill.